Sehr kompaktes und handliches Notebook mit drehbarem Touchscreen. Dadurch als Tablet PC mit Stifteingabe oder als Notebook mit Trackpoint nutzbar. Der Lüfter wird im Betrieb sehr laut. Das Fujitsu Siemens Lifebook P1510 ist einzigartig, weil es keinen anderen vollwertigen Tablet PC mit einem Gewicht von knapp einem Kilo gibt. Solche Einzigartigkeit verleitet viele Hersteller dazu, es mit ein paar Details nicht so genau zu nehmen. Dieser Fehler passiert auch Fujitsu Siemens: Die relativ hohe Abwärme des Geräts muss genauso wenig sein wie das laute Betriebsgeräusch des Lüfters - auch wenn sich dessen Verhalten dank neuer BIOS-Versionen deutlich gebessert hat. Mit dem Lifebook P1510 bringt Fujitsu-Siemens den bislang leichtesten Tablet-PC auf den Markt. Doch lässt sich der Winzling dankt integrierter Tastatur sogar auch noch als Subnotebook verwenden. Plus: Nur 1,0 Kilogramm schwer; Kompakte Abmessungen; Convertible-Bauweise. Minus: Nur wenige Anschlüsse; Konzeptbedingt kleine Tasten. Pro: hohe Ausdauer, sehr klein und leicht, volle Tablet-PC-Funktionalität, erweiterte Sicherheits-Features, WLAN a/b/g Contra: Display und Tastatur recht klein, kein eingebautes optisches Laufwerk. Das Lifebook P1510D von Fujitsu-Siemens bietet zahlreiche Features und Funktionen in einer sehr kleinen und hübschen Verpackung. Wer auf der Suche nach einem ultraportablen System ist und mit einer kleinen Tastatur und dem etwas unsensibel reagierenden Trackstick leben kann, für den ist dieser Laptop definitiv eine gute Wahl. Die Akkulaufzeit ist allerdings mit etwas mehr als drei Stunden mit dem Standardakku nicht wirklich überzeugend. 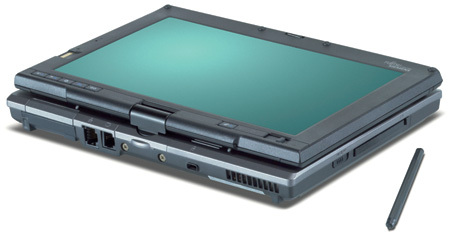 Fujitsu Siemens' winziges Lifebook P1510 ist ein Convertible Tablet-PC mit vielen Pluspunkten. Nicht jeder dürfte aber mit der kleinen Tastatur und dem Mini-Bildschirm zurechkommen. Die Akkulaufzeit enttäuscht. Fujitsu Siemens hat sich schon viele Jahre als Tablet-PC-Spezialist gezeigt. Auch derzeit sind sowohl Geräte im "Slate"- Design wie der Stylistic ST5022 als auch "Convertibles" wie das Lifebook T4010C verfügbar. Das neueste Modell kann im Notebook-Modus mit dem Toshiba Libretto U100 konkurrieren, ist aber im Tablet-Modus nur ein Stück dicker als der Slate LS800 von Motion Computing. Certainly one of the coolest, sexiest yet functional super-small notebooks available in the US. The specs and power make this machine good enough for business and school use while Windows XP Tablet Edition puts the touch screen to good use with better support for pen and voice input compared to non-Tablet Edition OS P1500 models. The screen's resolution is high enough to make web browsing and working with MS Office documents pleasant though the 8.9" LCD may cause some eyestrain when run at full resolution. If you need and want one of the lightest notebooks on the market, don't want to compromise on specs and find the Tablet features useful, the P1510D should be on your shortlist despite a few shortcomings (lack of an optical drive, poor viewing angle and not the most colorful and sharp display). This Fujitsu Siemens unit is truly two items in one case, it is a rather nice small but powerful notebook computer and also probably the best Tablet PC I have used. It is 23x17x3.5cm and weights in at only slightly more than a kilo. I was sent it with a DVD RW super multidrive that is likely to add around £190 to the price however as this connects via USB any CD or DVD that connects this way will work and with large format pen stick drives around any software you want to install could firstly be copied to a pen stick drive using a CD from any PC. This is not a cheap product but bear in mind it is truly two products in one. The Fujitsu P1510D is a Convertible style Tablet PC, that boots in just under 50 seconds with 512 ram installed. We got 2 hours and 16 minutes battery life with the Tablet running in always on mode, the wireless on, no standby, no hibernate and the screen and hard drive set to always on. Needless to say we would like to see a longer battery life, but in all fairness to Fujitsu as end users we want it all. Small size, light weight, big performance, long battery life, low price. Unfortunately at this point in time the technology to give us the lightweight long life battery's at a low price just isn't there. Fujitsu Siemens claim the Lifebook P1510 is the world’s lightest convertible tablet, and there’s plenty of technology packed into the 1kg chassis. It looks like a conventional notebook, but the screen measures 8.9in, so everything is scaled down in size. The screen, which is bright and clear, has a resolution of 1,024 x 600 and gives an unusual aspect ratio of 17:10. This makes it feel narrow when you’re using the tablet in portrait mode. Five buttons sit at the bottom right and assist general navigation. We admit falling in love with the first Fujitsu P1510D when we tried it last summer, and this update only deepens our admiration for its blend of portability and usability. Now with a bit more internal memory (512MB) a lower price ($1,599), and the Tablet PC version of Windows XP built-in, the most portable micro-PC gets a smidgeon better. Excellent performance for the size, enterprise-grade Wi-Fi support, and an exceptionally well-designed compact keyboard layout make this our favorite ultra-ultra-light. Unfortunately, some earlier flaws remain unchanged. Power up this 2.2-pound metallic gray clamshell and you're greeted with performance. The 1.2-GHz Pentium M and 4,200-rpm 30GB hard drive work quite well together to deliver snappy performance for program loading, processing, and window repositioning. Im Test waren vier Subnotebooks mit den Bewertungen 1 x "gut" und 3 x "befriedigend". Ein Notebook ist eine praktische Sache. Vor allem dann, wenn es klein ist, kaum etwas wiegt und dennoch allen Aufgaben gewachsen ist. Deutsch-japanische Koproduktion: Das Lifebook P7010 von Fujitsu-Siemens sieht klasse aus, ist klein und leicht, aber leider entpuppt sich der eingebaute Lüfter als Störenfried. Im Test waren sechs Notebooks mit Bewertungen von 394 bis 420 von jeweils 500 Punkten. Das Fujitsu Siemens Lifebook P7010 gehört fast zur Klasse der ultrakompakten Mini-Notebooks. 74% Wenig dran, aber alles dabei! Im Test waren drei Notebooks, davon eines nur als Vorschau, mit den Bewertungen 2 x 4 von 5 Sternen. So klein kann praktisch sein: Das Lifebook P7010 bietet bis hin zur tollen Ausdauer alles, was man braucht. Fotofreunde aufgepasst: Mit dem Lifebook P7010 lassen sich schon unterwegs Bilder der Digitalkamera bearbeiten. Das Display brilliert dabei durch einen hohen Bildkontrast. I received my P7010D today and I must say I am definitely impressed. As some of you may know, I am an ultraportable fan, and just came back to Pentium-M, after having abandoned it for about 6 months. Stylisch weißes Notebook mit griffweicher Unterseite. Gute Leistung und sehr lange Akkulaufzeit. Passive Kühlung, dadurch ist das Lifebook P7120 sehr leise. Eigene Taste zum Einschalten des Energiesparmodus. Mit dem Lifebook P7120 hat Fujitsu Siemens die Notebook-Klasse unter zwei Kilo um ein gut ausgestattetes Gerät mit langer Akkulaufzeit bereichert. Der niedrige Geräuschpegel und helle Bildschirm überzeugen besonders. Als Subnotebook ist das Lifebook P7120 von Fujitsu Siemens der Nachfolger des P7010, aber kleiner, leichter und genauso gut ausgestattet - inklusive DVD-Brenner, den in dieser Gewichtsklasse viele Notebooks nicht haben. Das Beste ist aber, dass man trotz Gewichtsersparnis und Kompaktheit keine Leistungseinbußen hinnemen muss, und auch die Akkulaufzeit überzeugt. Statt auf ein internes optisches Laufwerk zu verzichten, hat Fujitsu-Siemens bei seinem Lifebook P-7120 ein kleineres Display eingebaut, um ein Gewicht von unter 1,5 Kilogramm zu realisieren. Plus: Nur 1,4 Kilogramm schwer; Modulschacht vorhanden; Lange Akkulaufzeiten; Vielfältige Schnittstellen. Minus: Verkleinerte Tastatur. Im Test waren 17 Subnotebooks mit Bewertungen von 465 bis 753 von jeweils 800 Punkten. Mit seinem 10,6 Zoll großen Display ist das Notebook ein sehr handlicher Kandidat mit zahlreichen Anschlussmöglichkeiten. Zweitakku und Port-Replikator sind im Lieferumfang. If you liked the LifeBook P7000, Fujitsu's stylish 3-pound laptop, you'll likely be equally enamored of the new and improved LifeBook P7120. This highly desirable and cleverly designed little black and charcoal machine has a handy two-battery option and a good keyboard. It isn't any cheaper at $2149 (as of 2/16/06), but consider its improvements over its predecessor: The 60GB hard drive, sealed before, is now user-replaceable so you don't have to leave your notebook at the repair shop. 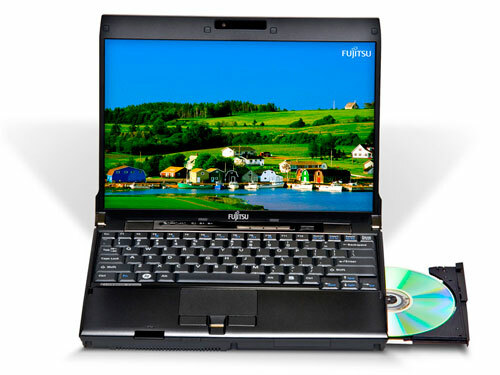 The ultraportable Fujitsu LifeBook P7120, an updated version of the Fujitsu LifeBook P7010D, is slimmer and lighter than its predecessor but remains packed with features, including a built-in DVD burner. Best of all, the LifeBook P7120 provides those features without compromising performance or battery life, and does it for the same price as the LifeBook P7010D. Its slightly more expensive competitor, the Sony VAIO TX670P, offers wireless WAN, longer battery life, and a larger screen in an even lighter case. If you want cellular connectivity or a battery that lasts more than six hours, the VAIO TX670P is worth the extra cost; otherwise, the Fujitsu LifeBook P7120 offers a slightly more affordable balance of performance, features, and portability for business travelers. For those who spend more time on the road than in their offices, there’s the Fujitsu LifeBook P7120. This 3.2-pound ultraportable, decked out in a satin black finish (with a metallic gray base), weighs a little over three pounds yet packs in all of the features a road warrior could want. With a TPM chip and fingerprint sensor built in, it’s a good business-minded alternative to Sony’s 2.8-pound VGN-TX650P that costs $50 less. In order to offer such a compact design, the P7120 features a small, 10.6-inch widescreen display. It’s fine for taking notes in Word and watching DVDs up close using the built-in optical drive, but its glossy coating has a tendency to reflect ambient light, which can be particularly annoying when working with an application like Word. Performance wise the Lifebook P7120 is no scorcher, but it compares well to similar machines. However, the Sony Vaio TX1XP offered about the same performance and had longer battery life, but at a higher price. Still, with seven minutes short of five hours battery life in MobileMark 2005 it’s hard to complain and the DVD playback test was two minutes short of four hours. This doesn’t mean that the Lifebook P7120 is a bad notebook by any means as there are few that can touch it in terms of battery life in its class. The Lifebook P7120 is yet another excellent ultra portable machine from Fujitsu-Siemens which offers a wide range of features, good battery life and considering its size a very attractive price. To call the Fujitsu LifeBook P7120 just a plain old ultraportable notebook is a serious injustice. The P7120 takes into account everything a mobile user needs, whether they're flying business class or commuting by train into the office. Some of the rare finds in this ultraportable include a dual-layer DVD±R optical drive and a fingerprint reader—and that's just the beginning. The P7120 barely tips the scales; at 3.1 pounds, it's even lighter than its predecessor, the 3.3-pound P7010D. At 10.1" by 7.8" by 1.1", the notebook is small enough to slip into an oversized coat pocket. The unit is draped in magnesium alloy and comes in all black for now, but Fujitsu will introduce several other colors (red, green, and white, for example) this month. I was really concerned that the slower speed hard drive was going to kill the performance of this machine. I'm so happy to report that I don't find it to be an issue and the resulting benefits of smaller size and reduced heat are worth it. The unit is in fact fanless, which means you'll only hear everyone else's machines. The fan on the P7010 frequently ran, so to me, this is a huge deal. There are very few fanless notebooks on the market, but Fujitsu has done a fantastic job engineering this one. Plus: Nur 1030 Gramm schwer; Sehr kompakte Bauweise; Aktueller ULV-Prozessor; Als Tablet-PC einsetzbar. Minus: Konzeptbedingt kleine Tasten. Computers powered by the Windows XP Tablet PC Edition operating system, and equipped with a sensitive screen designed to interact with a complementary pen, are called Tablet PCs. Tablet PCs are fully-functional laptop PCs, but with the added benefit of being able to use a stylus/pen directly on the screen just as you would a mouse to do things like select, drag, and open files; or in place of a keyboard to handwrite notes and communication. Unlike a touch screen, the Tablet PC screen only receives information from this special pen. It will not take information from your finger or your shirt sleeve - so you can rest your wrist on the screen and write naturally. Your business doesn’t live in an office - it goes wherever you go. And with the LifeBook P1610 you have simple ways to connect, communicate, network, and get it done - whether you’re in the office or on the road. While the P1610 isn't going to win any performance awards, it's up to the job of everyday tasks. What it lacks in power it easily compensates for in portability. The keyboard is a little on the small side, but other than that it's a very usable machine. The tiny size comes at a premium, but when judged against other similar systems it's reasonably priced. It's a machine you really could take with you everywhere and still be able to get something done once you arrive. 70% Can Fujitsu Siemens make the Tablet PC useful? Tablet PC has never really caught the imagination of the average computer user. It’s great for business, where the interactive screen can be shared by a couple of people for writing notes. The Fujitsu Siemens P1610 is great to use and its light weight means you aren’t tied down to carrying a brick around with you. However, its battery life really lets the useability side down. It may be great to use in meetings but we’d recommend using at a secondary machine and not as your sole notebook. This ultra ultraportable features a swiveling, tablet-style screen. The Fujitsu LifeBook P1610 is a well-designed, extremely compact, and flexible notebook. Anyone who roams around a lot during the workday and needs continual access to a computer is an ideal candidate--particularly if price isn't a big concern. If you frequently spend some of your work day outside (for legitimate reasons--or not), you'd probably find this little computer invaluable, too. Otherwise, a full-featured ultraportable, such as Fujitsu's LifeBook P7120 or Sony's Vaio TX series, is probably a better bet. This attractive ultraportable model packs a lot of functionality--including a swiveling touch screen--into a tight space. Pick up the svelte Fujitsu LifeBook P1610, and you'll barely feel as if you're carrying a notebook PC. And no wonder: At 2.2 pounds, the $2419 (as of 12/18/06) P1610 puts the "ultra" in ultraportable. The P1610 is similar in weight and size to its predecessor, the LifeBook P1510. (It's slightly slimmer at 1.4 inches deep, and it measures 9.1 by 6.6 inches.) Included, however, are several notable improvements, among them a reasonably roomy 80GB hard drive, and a PC Card slot in lieu of the P1510's integrated CompactFlash slot. The Fujitsu LifeBook P1610 combines the best features of ultramobile PCs (tiny size, easy-to-use touch screen) and convertible tablets (an attached keyboard, laptop-caliber performance). 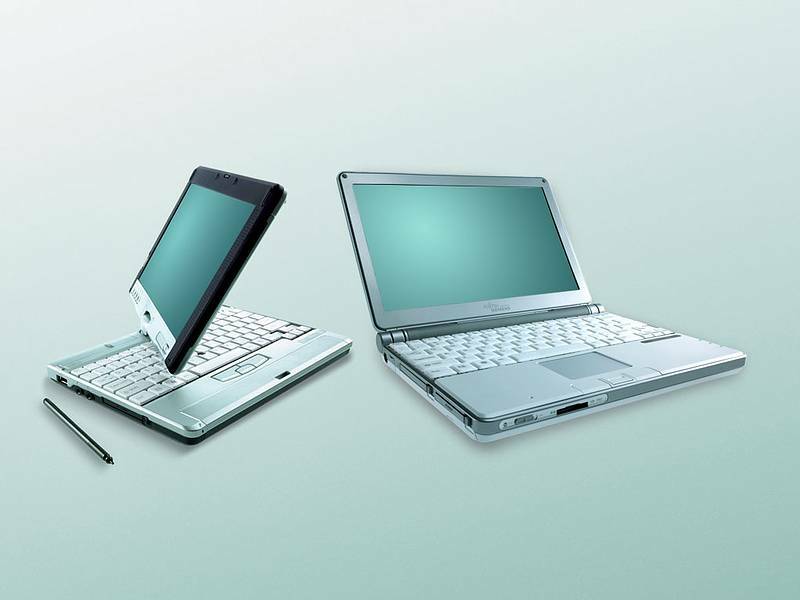 As with most hybrid technologies, however, the LifeBook P1610 forces you to make some compromises: its tiny keyboard makes extensive typing a challenge, and--though we'd like to carry the P1610 with us all day long--its battery life isn't enough to last through a full day of work. Hervorragendes Office-Notebook, auch für den Privatgebrauch, allerdings leider zu einem recht hohen Preis. Alternative: Das LG P300-U.ABRAG ist etwas größer und schwerer, aber leistungsfähiger und 650 Euro günstiger. Unterm Strich bringt das rund 2400 Euro teure Fujitsu Siemens Lifebook P8010alles mit, was anspruchsvollen Vielreisenden die Nutzung der Welt als Büroerleichtert. Platz zwei in der connect-Bestenliste ist der Lohn dafür. All this means that, despite excellent battery life, we’re not convinced by the P8010. If you’re after a truly luxurious business laptop, choose the pricier but also far superior Lenovo X300. However, the light weight results in an insubstantial specification. The processor is one of the weakest on test: an Intel Core 2 Duo SL7100 that runs at a mere 1.2GHz. While this does result in impressively low power demands (a 17W TDP to be precise), it also limits speed. All this means that, despite excellent battery life, we’re not convinced by the P8010. If you’re after a truly luxurious business laptop, choose the pricier but also far superior Lenovo X300. The Fujitsu was somewhat limited in our performance tests by its relatively slow 1.2 GHz Intel Core 2 Duo SL7100 CPU. However, the P8010 wasn’t held back by its hard drive, which is a 5,400 RPM SATA model, and the equal of the drives in the best performers in this ultraportable notebook roundup. Overall, Fujitsu has an interesting offering in their P8010 ultraportable, though it was (and still isn’t) the clear pick in its category. If you absolutely need an optical drive and you want a 12-inch system it could be a good choice, but there is enough competition out there that for most people it won’t be the way to go, even before you factor in the availability of newer systems. There is a lot to like about the P8010, but it is missing a few obvious features and the build quality could be improved, so given the price (currently about $1600-2000) buyers should give a good look at the competition first. That said, I’m looking forward to seeing what Fujitsu brings to market with the next model. Overall, the FSC Lifebook P8010 manages to more than live up to expectations. Its battery life is great, the screen impressive and if Fujitsu Siemens can improve on the keyboard, this could well be a winning laptop. Performance is good, discounting games, and although it's expensive it could justify its price tag if you need a built-in optical drive. 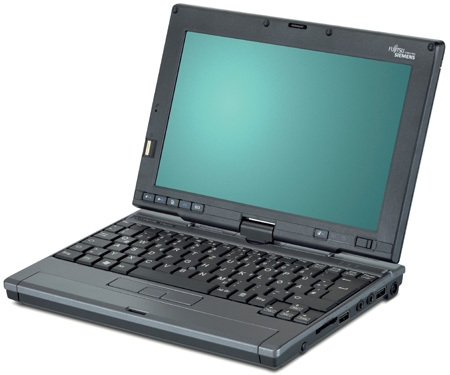 The Lifebook P8010 is a great little laptop for the mobile worker, especially once you take into account its long battery life and built in 3G connectivity. 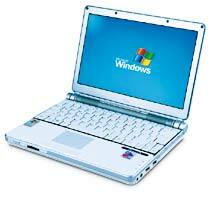 It's difficult to recommend the LifeBook P8010. It ticks most of the boxes required to make a good ultraportable, but it's simply too expensive in comparison to things like the MacBook Air. Business users might find some of its features useful, but for the rest of us, something like the Eee PC 1000 will do just fine. The ultra-portable business laptop market has undergone a huge shake-up in recent months, with a triple-release of outstanding new products: the Lenovo X300, MacBook Air and updated version of Sony's TZ series with the TZ31MN. All three of these laptop brought decent performance, impressively thin chassis and low weight, and all will attract jealous stares in the boardroom. Competing with Sony, Lenovo and Apple is no easy task, as this overpriced and unremarkable ultraportable proves. While the Fujitsu LifeBook P8010 is an adorably cute ultraportable, it doesn't pack much in the way of power. The Fujitsu LifeBook P8010 has almost everything a road warrior could want in an ultraportable—a sleek, lightweight design with a built-in DVD burner, long battery life, and good productivity performance. If you can live with a slightly cramped keyboard, you’ll be satisfied with this lightweight notebook. The LifeBook P8010 is a worthy upgrade to last year's ultraportable LifeBook, the P7230. Most importantly, it replaces the single-core processor with a low-voltage Core 2 Duo chip. Its dimensions swell slightly to accommodate a bigger 12-inch screen, but it still weighs in at a hair under 3 pounds. Call it the unassuming ultraportable. The Fujitsu LifeBook P8010 shuns attention-grabbing thinness and solid-state drives for a solid feature set for business travelers. The Fujitsu P8010 is a great performer when it comes to battery life, system performance, and cool temperatures. When you look at the build quality and design, it's a completely different picture, that doesn't stack up against older Fujitsu business notebooks. Body and chassis flex is greater than we would expect from a notebook in this price range. If you can look past the build quality, it is an excellent notebook in terms of its capabilities. Fujitsu's LifeBook P8010 is an affordable workhorse--it cost $1899 at the time of testing--but you'll need to equip it with more RAM to make it an adequate performer. And to those prospective buyers with oversize hands: Consider yourself warned. Packing an optical drive and terrific battery life into a 2.8-pound frame isn't easy, but this formula has been the cornerstone of the Fujitsu LifeBook P Series for several years. The Fujitsu LifeBook P8010 is part of a select group of laptops that integrate an optical drive and weigh less than 3 pounds. But Fujitsu needs to up its game by putting in a larger keyboard and faster components. Fujitsu's once trend setting P series of ultraportable notebooks has added some extra size that makes it much more comfortable to use than previous models, but it comes at the expensive of note being as innovative and unique as it once was. Fujitsu Siemens hat das Lifebook P1620 erstmals auf der CeBIT 2008 vorgestellt. Dort wurde ein Preis von 2970 Euro angegeben. Auch wenn die auf der geringen Größe gebotene Funktionalität durchaus überzeugen kann, deckt der Test ebenfalls die eine oder andere Schattenseite auf. Abstriche bezüglich des komfortablen Arbeitens im Tablett-Modus sind aufgrund der Höhe von 3,7 cm hinzunehmen. Dafür wiegt das Lifebook P1620 auch mit 6-Zellen Akku nicht mehr als 1195 Gramm. Das ausgesprochen kontrastreiche (1:506) 8,9 Zoll große Display überzeugt mit einer Auflösung von 1280x720 Pixeln. Allerdings werden dadurch Symbole und Schriften extrem klein. Auf dem Work-Flow wirkt sich dieser Umstand fast schon negativ aus. Außerdem gestaltet sich die vom Hersteller beworbene Touch-Screen-Navigation per Finger genau aus diesem Grund sehr schwierig. Erwähnenswert ist die integrierte UMTS-Fähigkeit. The Fujitsu LifeBook P1620 makes a few notable improvements on its predecessor, but a new breed of cheaper mini-laptops are on the horizon, making this ideal only for heavy tablet users, who may prefer a full-size tablet. 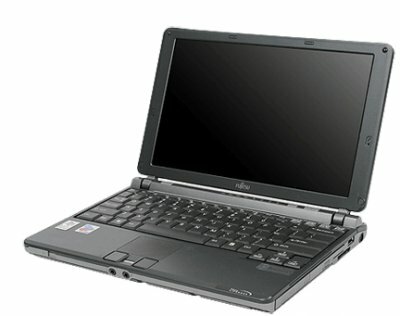 The Fujitsu LifeBook P1620 packs more than enough functionality and usability to justify paying more than two grand. Consumers interested in a tiny tablet on a budget should probably gravitate toward the $999 LifeBook U810—provided you’re willing to use a smaller 5.6-inch display—but we highly recommend this more versatile and secure convertible for road warriors and field workers. Although the Fujitsu Lifebook P1620 and Macbook Air aren’t marketed as direct competitors with each other, their light weight and convenient sizes certainly encourage comparison. In the final analysis, the Fujitsu Lifebook P1620 is, to our eyes, a more useful and utilitarian notebook than Apple’s Macbook Air. While the Fujitsu Lifebook P1620 is too thick to fit in a manila envelope, it’s lighter, smaller, arguably easier to pack and stow than the Macbook Air and offers a lot more ports and connectivity options. The Macbook Air, on the other hand, appears to be more aesthetically pleasing than the Lifebook, has a larger display and is available with a faster processor. But its lack of hardware adaptability, connectivity options and the ability to change the battery limits its usefulness in comparison to the Fujitsu Lifebook P1620. It has the features and build quality we’ve come to expect from the Lifebook series including an LED backlit 8.9" WXGA Transmissive anti-glare screen and integrated 3.5G wireless internet capabilities. Under the hood, an Intel Core 2 Duo SU9300 processor running at 1.2GHz powers the P1360. The Fujitsu Lifebook P1360 is a highly portable tablet PC solution and will suit those that need something that performs well but is also suitable for taking on the road. It performed well and apart from a few small things we didn’t have any major problems with it. Fujitsu-Siemens: Fujitsu Limited, ist ein japanischer Technologiekonzern mit 161.000 (März 2007) Mitarbeitern weltweit, dessen Ursprünge ins Jahr 1935 zurückreichen. Schwerpunkte der Produkte und Dienstleistungen sind Informationstechnologie, Telekommunikation, Halbleiter und Netzwerke. 1999 startete dieZusammenarbeit mit Siemens im IT-Bereich (Server, Notebooks, Desktop-PCs, etc.) unter der Marke Fujitsu-Siemens. 10 Jahre später endete diese Kooperation. FSC gehörte zu den grösseren internationalen Herstellern mit besonders hohen Marktanteilen in Deutschland. alle aktuellen Testberichte von Fujitsu-SiemensFujitsu: Fujitsu Limited, ist ein japanischer Technologiekonzern mit 162.000 (2014) Mitarbeitern weltweit, dessen Ursprünge ins Jahr 1935 zurückreichen. Schwerpunkte der Produkte und Dienstleistungen sind Informationstechnologie, Telekommunikation, Halbleiter und Netzwerke. 1999 startete die Zusammenarbeit mit Siemens im IT-Bereich (Server, Notebooks, Desktop-PCs, etc.) unter der Marke Fujitsu-Siemens. 10 Jahre später endete diese Kooperation. Fujitsu ist ein Laptop-Hersteller mittlerer Größe, der sich in den letzten Jahre nicht unter den globalen Top 10 findet. Am Smartphone-Sektor spielt Fujitsu so gut wie gar keine Rolle. Die Bewertungen der Tests sind überdurchschnittlich gut (2016). Intel Graphics Media Accelerator (GMA) 900: Mobiler onboard (shared Memory) Grafikchip (auf Mobile Intel 915GM Chipsatz), ohne Hardware T&L - kaum spielefähig. Für Office und andere Anwendungsprogramme ohne 3D sehr gut geeignet.Intel Extreme Graphics 2: Onboard (shared Memory) Grafikkarte, die durch schlechte Leistung und nicht spiele-optimierten Treibern nicht für Spiele geeignet ist. Office und Bildbearbeitung bereiten jedoch keine Probleme. Kein Aero Support.Intel Graphics Media Accelerator (GMA) 950: Integrierter (onboard) Grafikchip auf Mobile Intel 945GM/C/Z/ME/ML Chipsätzen und Nachfolger des GMA 900. Kein Hardware T&L (für manche Spiele benötigt). Für Spiele kaum geeignet.Intel Graphics Media Accelerator (GMA) X3100: Integrierte shared Memory Grafikkarte von Intel, die im 965GM und GL960 Chipsatz eingebaut ist. Dank voll programmierbarer Pipeline DX 10 fähig (mit Treibern seit 15.9.0.1472). Gute Performance für eine integrierte Grafikkarte, jedoch trotzdem kaum spielefähig.Diese Karten können nur sehr alte und sehr anspruchslose 3D Spiele flüssig darstellen. Anwendungen wie Office, Internet surfen, Bildbearbeitung oder (SD) Videoschnitt sind jedoch ohne große Einschränkungen möglich. SU9300: Langsam getakteter Core 2 Duo ULV Prozessor für kleine und leichte Notebooks. Bietet Virtualisierungs und Trusted Execution Unterstützung. 73.98%: Diese Bewertung ist schlecht. Die meisten Notebooks werden besser beurteilt. Als Kaufempfehlung darf man das nicht sehen. Auch wenn Verbalbewertungen in diesem Bereich gar nicht so schlecht klingen ("genügend" oder "befriedigend"), meist sind es Euphemismen, die eine Klassifikation als unterdurchschnittliches Notebook verschleiern.» Lesen Sie auch unsere Notebook-Kaufberatung.